Trailer Alignments in Colorado Springs, CO 80907 - Rocky Mountain Spring and Suspension, Inc.
Boating season is just around the corner. As you’re prepping your boat, whether it’s for fishing or leisure, don’t forget about what gets it to the lake safely. You can almost bet last season took a toll on your trailer. Pressure on shocks, springs and tires can cause the trailer to slip out of alignment. This can pose a safety risk to both yourself and others when it comes to towing a boat down the highway. The trailer will become off-center, making it difficult to steer in a straight line. 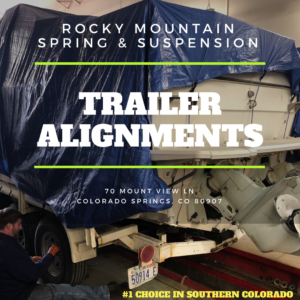 Rocky Mountain Spring & Suspension is the #1 Choice in Colorado Springs, CO 8090 and Southern Colorado for trailer and commercial truck alignments.